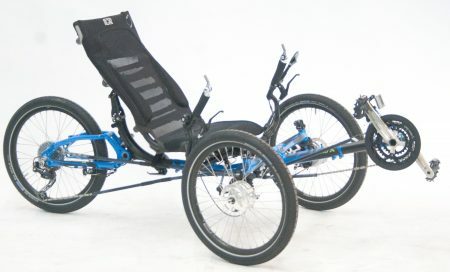 The Sidewinder Sport Z tadpole was one of the least expensive tadpole recumbent tricycles on the market at $1595 till Terratrike introduced their Rover trikes starting under $1000. The Sidewinder and Rover have some similarities: both of their seats are higher than most tadpole trikes making it easier to get on and off the trike; both of them are a bit heavy and have relatively poor high speed handling. We currently do not stock a Sidewinder but do stock the Terratrike Rover. The Sidewinder’s patented drive system puts power to both front wheels and allows rear wheel steering, unusual on a trike. 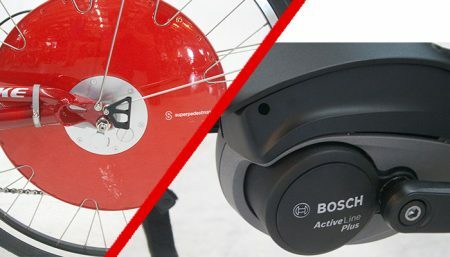 Even more unusual is their detachable steering linkage which allows you to disconnect the handlebars from the steering wheel with the flick of a lever. When the steering is disconnected you can turn in very tight circles by applying one or the other of the two front mechanical disk brakes. This can be fun at slow speeds in a parking lot where there is no traffic but would be very dangerous on the road, especially at speeds over 5 or 10 MPH. At about 47 lb The Sidewinder is pretty heavy and slow and not well suited for riding distances or going fast. I found the seat to be moderately comfortable: much more comfy than a non recumbent, not as comfy as most other recumbents. Seat adjustment is fairly quick and easy and the seat recline is adjustable too. The seat adjustment is not fine-tunable for maximum pedaling efficiency but that’s OK. Riders who most enjoy the Sidewinder aren’t much interested in maximum pedaling efficiency. The front pedal tube is also adjustable. Overall the Sport-Z can be adjusted to fit riders with X-seams from about 36” to about 50”. The full mesh seat is well ventilated. Thin riders may wish the seat bottom was padded, large riders may wish the sides of the frame were farther apart. 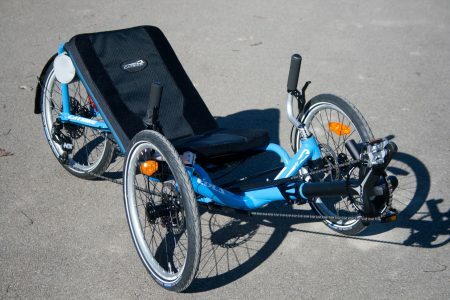 The Sport-Z is a tadpole recumbent tricycle designed for exercise and recreation more than transportation or touring. It does fold for storage or transport and will fit into the trunk of some cars. It does not fold as small as the Greenspeed GT-3. It has 21 speed Shimano gears and a gear inch range from 17.5 to 95 so it will climb steep hills if you are persistent and not in a hurry. The gears are controlled by SRAM Grip shifters. The gears components are Shimano Sora quality level. 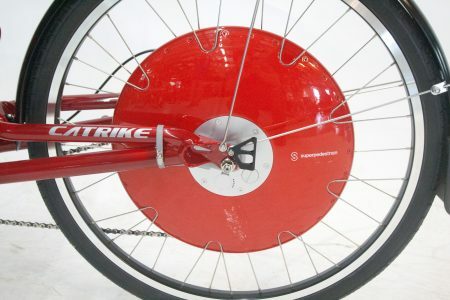 You can call them a recumbent cycle, recumbent tricycle or a recumbent trike. A tadpole recumbent trike may be a good way for you to enjoy the outdoors while getting some exercise, try one and see for yourself!